Rep. Alexandria Ocasio-Cortez picked the wrong guy to get in a fight with Thursday night. Sure, journalists have a wretched rap right now. But a congresswoman calling out a Washington Post fact checker — and not getting her facts right — is a brutally bad look. Let’s put this all in some context: The splashy, new, dancing New York House Democrat, who once claimed there the three branches of government are the House, Senate and the presidency, is scheduled to head off to Utah’s famed Sundance Film Festival Friday for a three-day jaunt. Because where else would an edgy, social media-savvy member of Congress go during a government shutdown? In the marble halls of Congress, she is dangled as an expert for her crustier colleagues because she has amassed 2.64 million followers. Lights. Cameras. Attention. AOC is into all of it. No matter how scared she claims she is by the spotlight. 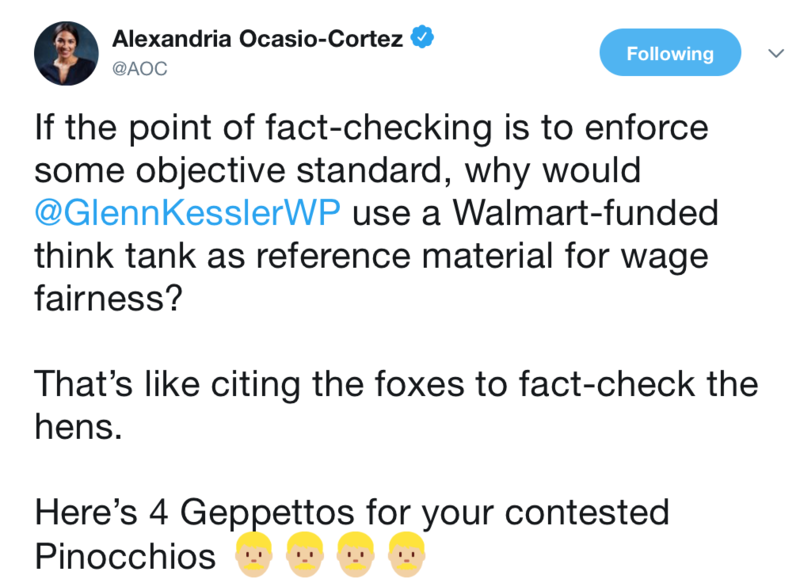 On Thursday, WaPo‘s supreme Fact-Checker Glenn Kessler fired off a fack-check on Ocasio-Cortez in which he awarded her three Pinocchios. The headline: “Ocasio-Cortez misfired facts on living wage and minimum wage.” In the story, Kessler wrote that she “is sometimes fast and loose with her facts.” Kessler explained in his piece that even before his story ran, he had a “tense” conversation with her spokesman. Even liberal New York mag business columnist Josh Barro called AOC to the carpet for fudging her facts. Shorter Kessler: Do your homework. You are dumb. I am smart. Shorter Ocasio-Cortez: I know how to use social media. Shorter Kessler: This is too complex for your brain. Liberal reporter Ryan Grim of The Intercept and previously Huffpost, rode in on a white horse Friday morning to side with Ocasio-Cortez. But it was a little late — she had already sort of apologized. So something prompted AOC to offer slight remorse, however phony. “You might want to do a little research on Jason Furman and then apologize for the implications in this tweet,” he wrote. At 8:30 a.m. Friday, AOC offered a lukewarm apology on Twitter. “I am criticizing the rationale of saying we should trust a questioned source paper because of a standing friendship and X admin, bc neither preclude the possibility of revolving door politics – if the tweet read as though I was going after @JasonFurmon [sic] specifically, I apologize,” she wrote. “If the tweet read…” and “I apologize” are not words that are used in a sincere apology. She detaches herself from her thought. All in all, the congresswoman’s apology is half-assed.